Flipping on the light switch at dusk is second nature, and we’ve come to expect the warm glow of incandescent light bulbs. Greater consciousness about environmental issues is leading people to switch to compact fluorescent bulbs, and technology is paving the way to even more eco-friendly LED lights. 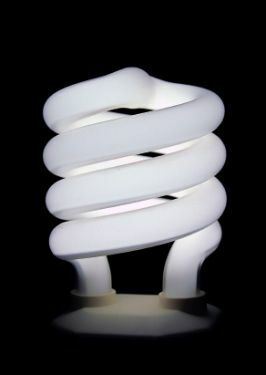 Although compact fluorescent light bulbs are gaining in popularity, incandescent light bulbs still produce much of our household lighting. Edison’s light bulb replaced the carbon arc lamp, which was extensively used throughout the U.S. and the world from the late 1870s. Arc lamps produce a very intense light, which is not practical for lighting small interior spaces. However, even after the advent of the incandescent bulb, arc lamps survived for decades as streetlights and for lighting large interior spaces, such as factories and mills. Incandescent bulbs just didn’t have the brightness of arc lamps. Today, carbon arc lamps are still used in some large spotlights and projectors. 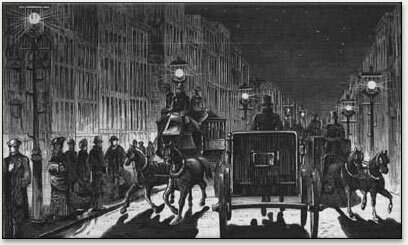 Broadway lit by Brush lamps in 1881, New York City. Arc lamp from General Electric Corp, (GE), ca. 1911. Two carbon rods connected to a current limited source are brought together and then drawn apart. As the carbons separate, a hot ionized path, the arc, is created between them. The arc continues to conduct after the carbons have been separated. This arc burns at thousands of degrees and heats the ends of the carbons to incandescence. Most of the light comes from the tips of the carbons, not the arc itself. As the carbons burn down, they need to be adjusted to maintain the proper spacing so that the arc does not go out. 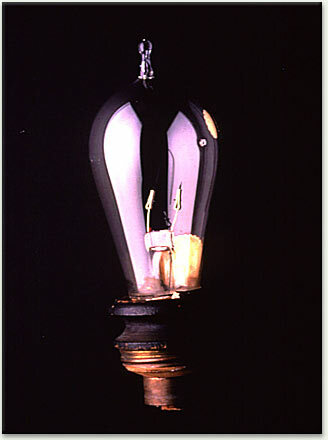 The "Brush arc lamp" from GE resolved this "spacing" issue, and became commercially successful by the late 1870s, ushering in the era of electric light. 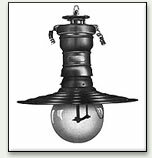 Incandescent bulbs have gone by many names, including electric lamps, globes, and light globes. Incandescence is the release of electromagnetic radiation, usually visible radiation, from a radiating heated body. Incandescent lamps produce light by using electricity to heat a thin strip of material called a filament. The filament resists the flow of electrons and this resistance heats up the filament until it glows. The color of this glow depends on the temperature, since the filament becomes a black body radiator. The enclosing glass bulb keeps the hot filament in a vacuum or an inert gas, as oxygen would allow the filament to burn and be destroyed rapidly by oxidation. Today, a bulb’s filament is made of tungsten  a special metal that can maintain a high temperature for hundreds of hours without burning through. What color is electric light? A glowing filament is white, and we describe its incandescent light as white. However, the actual wavelength components of different electric light sources vary, so that we perceive white with a bluish cast as "cool" and white with a pinkish cast as "warm". As these labels are vague, tools such as the color rendering index (CRI) and color temperature have been developed. These have a number of important applications, such as establishing standards for photography, and identifying different kinds of fluorescent lights. Photographs frequently reveal that ambient light is slightly orange or blue, and photographers have to compensate to create a neutral color balance. Today, of course, digital imaging allows for corrections to be made after a photograph is taken. Patent drawing of Edison’s Electric Lamp, January 27, 1880. On December 31, 1879, Thomas Edison demonstrated his most famous invention: the first practical incandescent electric lamp. He was not, however, the first inventor to experiment with electric light. 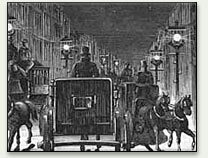 When Edison began testing possibilities for incandescent lamps, the arc light was already becoming popular for lighting streets, department stores, and other large areas. Many inventors tried to perfect incandescent lamps to "sub-divide" electric light or make it smaller and weaker. Edison tried to find a material that would become incandescent and not melt when heated by electricity. For a long time he experimented with platinum, but finally he made his filaments by carbonizing a kind of cardboard called Bristol board. In earlier lamps, too much oxygen caused the filaments to burn. Edison acquired the best vacuum pumps so he could empty his bulbs of as much air as possible. Because of this, his carbon filaments did not burn. Edison also developed an entire system to produce electricity and distribute it to many places at the same time. Edison’s system included dynamos, switches, electric meters, fuses, distribution lines, and regulators. One of the most important features of Edison’s lamp and electrical system was the simple, modern socket familiar to us today. Incandescent bulbs are widely used in homes, industry, and commerce, but they vary tremendously in size, shape, and energy output. Nevertheless, they are cheap to make and can run from a direct current source (such as a battery) or on alternating current electricity supplied through a distribution grid. This makes incandescent bulbs ideal for portable lighting (such as indoor lamps, car headlamps, and flashlights), decorative lights, and outdoor billboard illumination. Because an incandescent bulb creates heat as well as light, it is widely used to heat enclosed areas like incubators and animal tanks, and even to heat food. This radiant heat is useful in cold climates, but it becomes a liability in hot climates, where the heat emitted has to be removed again, for instance adding to the work of an air conditioner. An incandescent light bulb is an inefficient light source, in the sense that most of the input energy is used to heat the filament, and only a small proportion is emitted as visible light. As there is increasing pressure on our fuel and energy resources, there is great interest in devices that produce similar output of visible light, but require less electrical energy. For example, incandescent light bulbs in homes and offices are being replaced by fluorescent lights, especially compact fluorescent lights. Phosphor formulations have improved the subjective color of the light emitted by compact fluorescent lights to match the familiar tones of incandescent light bulbs. Unlike incandescent light bulbs, these light bulbs do not get hot. 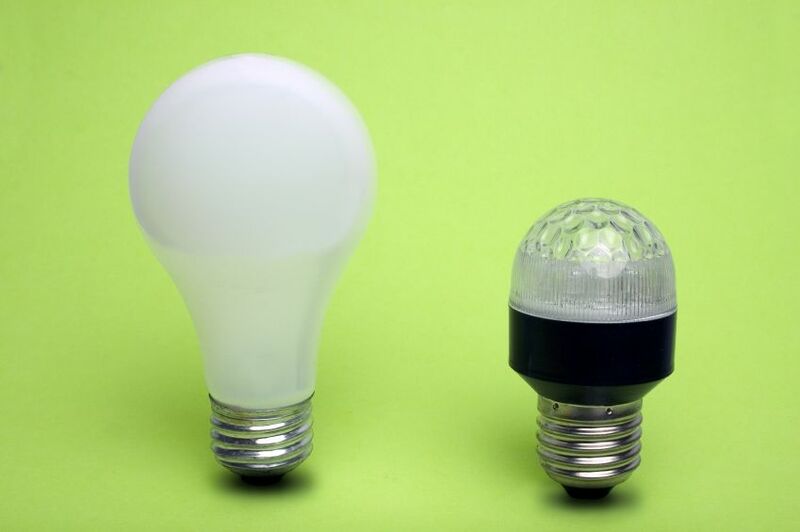 LED light bulb shown next to an incandescent light bulb. LEDs are suited to a growing range of applications, including use in traffic lights, decorative lights, electronic devices, and bicycle lights. As LED technology develops, the range of available colors has extended from red, green, and yellow to blue and blue-white. Eventually, LEDs will be able to produce the warm, yellowish-white light we associate with incandescent bulbs, and will likely become the lighting source of choice. Fluorescent lights rely on gas excitations to produce light. An ionized gas within a compact fluorescent light (left) is excited by an electrical discharge. As this electrical field accelerates free electrons, they collide with gas and metal atoms to excite their electrons to a higher energy state. As these excited electrons drop back to a lower energy state, they emit photons of light. These photons have wavelengths in the visible and ultraviolet ranges. Ultraviolet radiation strikes the fluorescent coating on the inner surface of the tube, which emits visible light. Concepts such as color temperature do not apply to more energy-efficient light sources, though sometimes they may be translated into equivalent concepts, such as correlated color temperature. The lights are not all equally white, and as with incandescent light, a measurable "whiteness" of lighting is very important in fields such as photography and in the design of mood-setting indoor lighting.